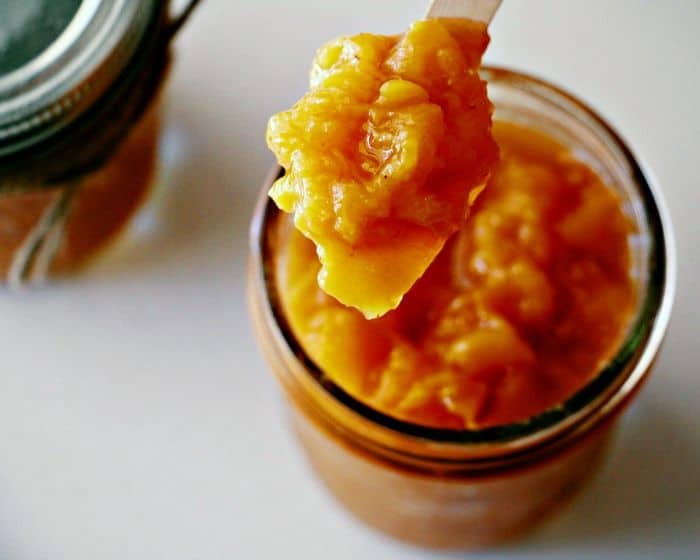 This peach butter is so sweet and packed full of peachy goodness. Perfect on fresh bread with a big dollop of yoghurt, stirred through your morning oats, or as a topping for pancakes or ice cream. You can also eat it straight from the jar, no judgement here. 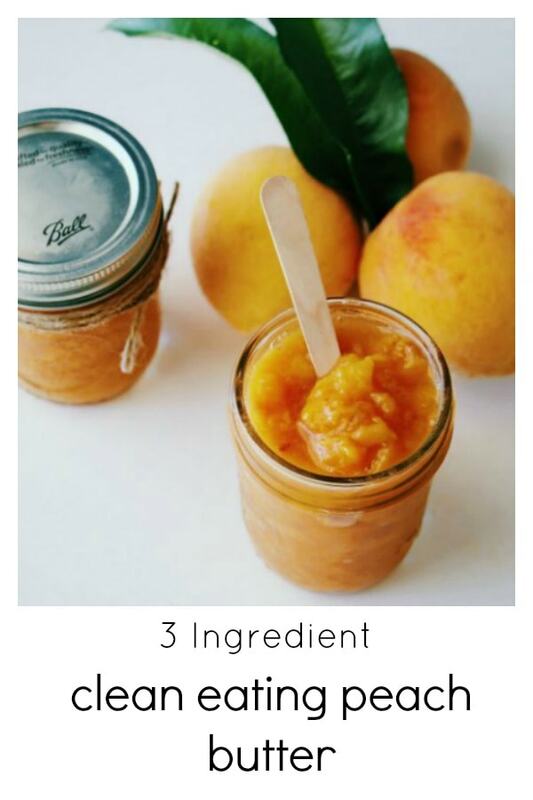 Let me introduce you to the amazing flavor that is 3 ingredient peach butter. Usually I have an idea of all my posts for the month a couple of weeks in advance. 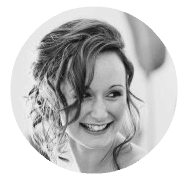 What can I say, I am a total organisational nerd – note: that doesn’t mean I am organised at all, it just means I like writing lots of lists…and then forgetting all about them 🙂 Whether I follow those lists or not, well that varies! So, this month, I had all my posts organised in a lovely little list, and this one was not on there. This one happened as a side note whilst making some canned peaches. It was so good though, I couldn’t wait to share it with you, and it has been pushed to the front of the line (I am a total rebel, I know). 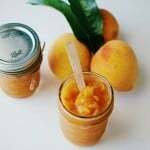 How Do I store and Eat 3 Ingredient Peach Butter? 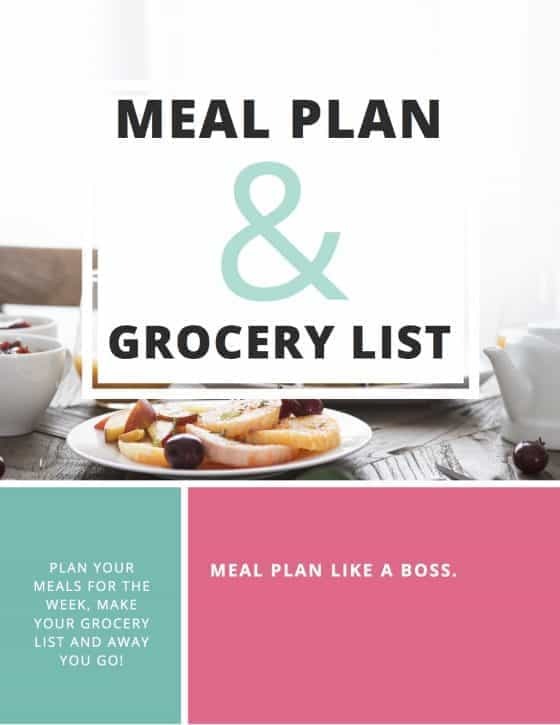 This will last 2-3 weeks in the fridge if you store it in an airtight container (but it won’t, because you will eat it all as soon as you make it). I have been having it on some fresh bread with yoghurt, adding it to our morning oats, and using it as a topping for pancakes and ice cream too. It can also be stored in the freezer if you make a big batch. Any Tips on Peeling Peaches? 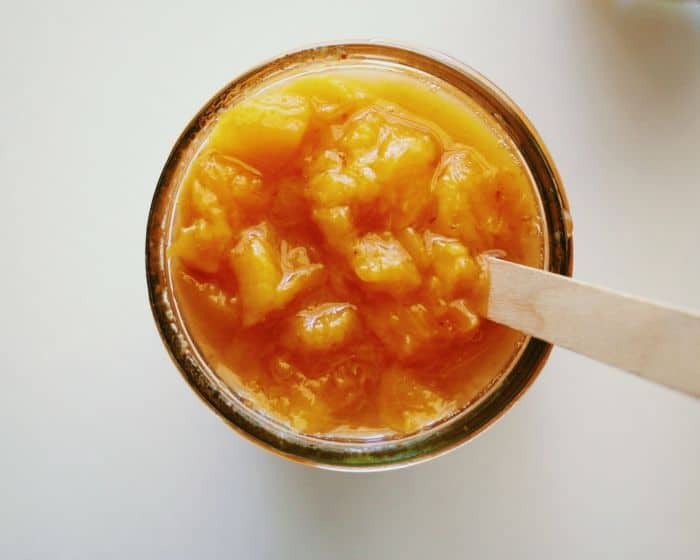 I just love hearing from you, so be sure to pop back and leave a comment once you try out my peach butter! Happy eating. I prefer mine to be a little bit chunky. However if you prefer a smoother butter, just give the mixture a bit of a mash before popping into the storage jars - the peaches are super soft at this stage and will just collapse. For tips on how to perfectly peel a peach go here. I found your recipe after trying to put peaches through my juicer and ending up with some fabulous pulp. I put that on the burner with honey. But I’m allergic to lemon so I added a splash of spiced rum from our local distillery. Yeah, I know…not exactly the same food group. But this is ridiculously tasty. Fresh baked bread is next. Haha I love this, I can imagine the spiced rum would have tasted amazing!! I might have to try that myself next time 🙂 Fresh baked bread is the BEST – enjoy!! So excited for this! Do I need to stir a lot as it simmers? Also my peaches are super juicy, if it doesn’t get thick enough so I just keep letting it simmer? You do need to stir it, not continuously, but pretty regularly just to be sure it doesn’t over heat and start sticking to the bottom of the pan. I have used super juicy peaches on many occasions and it has worked out just fine, just simmer until you get the desired consistency. Enjoy! Hi there ! Did you ever end up canning this recipe ? Hi Ashley, no I haven’t! It has been on my list for what seems like forever now but I haven’t gotten around to it. I can peach slices using a similar recipe (just honey and water) and they turn out perfectly, so I assume the peach butter would be fine. One day I will get around to it 🙂 So many recipes, so little time! I made your peach butter yesterday and it is delicious. I also looked at your hint on peeling peaches and scored my peaches first as you suggest and it worked wonderfully. I made your peach butter yesterday. It is delicious! I took a moment and read your ‘now to peel peaches’, I had never scored the peaches first, it made a big difference. Thanks for this recipe and the tips. It makes such a huge difference doesn’t it!! We do it every time now 🙂 Glad you enjoyed it, and thanks so much for taking the time to pop back and leave a comment! I noticed in a previous comment you were going to try canning this recipe, I am just curious if you had any luck. We always seem to be short on freezer space so the more items I can keep canned the better. Either way I can’t wait to try this out! Hi Trista, I actually haven’t!! I ended up experimenting with different ways of canning peach slices and ran out of produce before I could make more peach butter. My tree is exploding right now though, so I plan on trying my hand at canning some this weekend, I will let you know how I go!! I haven’t tried with canned peaches but I am sure they would work just fine!! Am just making ur butter….should I cover the pan while cooking? I cut ur recipe in half…only having three peaches. I filled 2.5 yogurt jars with it. I added a bit more honey and a bit of cinnamon – it is delicious! My husband is diabetic, so I absolutely love that there’s NO sugar in it. I’m so happy to have found ur recipe! If i put it in canning jars how long will it last? Peaches are on sale this week at Kroger, time to stock-up and make peach butter. What a great recipe. I love peaches but have never had peach butter before! Thanks so much. Oh it is so good Judy! I am all about using honey in place of sugar in my recipes too! I am a hobby bee keeper. I will be making a trip to the farmers market this week so I can make this – I’d like to freeze a few jars – what do you think? Don’t you think it will freeze well? I literally just pulled two jars out of the freezer this morning, and they were great! Hobby bee keeper – how fun!! So glad you shared this! It’ll be perfect way to wrap up the summer! Oh my gosh – I totally know what you mean about the lists. I feel like most the time I just like writing lists for the sake of writing it, but then I end up totally not following it at all. It just feels so therapeutic to have things looks organized, ya know? I’m in love with this recipe because I’ve got a fair few peaches that need using and this is the perfect recipe just for that! i’m older. I learned to put ‘don’t lose’ notes in big school notebook. each year I get new one. works beautiful . Simple ingredients, amazing results!!! Gotta try this peach butter, it’s too tempting not to. 🙂 Thanks for sharing! You’re speaking my language with this one! Amazing! When my husband gets home, we’re going to have to try this out! He loves peaches – this would be right up his alley! 2. Do you have a muffin I can smear that on? Oh, I love love love this recipe! I am going to pick peaches in a couple of weeks at a farm near by and I’m definitely making this butter! Oh enjoy peach picking, so much fun!! Wow! And super simple! TFS!! This is perfect!!! I have some super ripe peaches that I don’t know what to do with right now! Have you ever tried freezing the peach butter for later? Yes! I literally pulled two jars from the freezer this morning, and they were perfect! I will definitely have to get some peach butter action when peaches appear here again. Sounds addictive. This looks so good! I’ve recently been diagnosed with a bunch of food allergies and can’t enjoy the yummy stuff anymore. But I CAN eat this, so thank you! 🙂 Making it tomorrow! Looks good! I’ve never had peach butter before. Yum! This looks so good! I’ll have to make some today. I love this! Kind of like peach jam but so much faster! Thanks. This looks delicious and super easy. I love that you make it with honey instead of sugar. Yum! Thanks Kirsten! Ripened peaches are definitely sweet enough, which makes it so easy to get away with just a little bit of honey! I was just looking for a perfect peach butter recipe on pinterest last night! I made a whole board with all things peach. The peach season is almost over and I was hoping to make one last peachy thing this year. I think I will just try your recipe now. I have never heard of peach butter. Sounds wonderful. Peach butter? That sounds absolutely amazing! 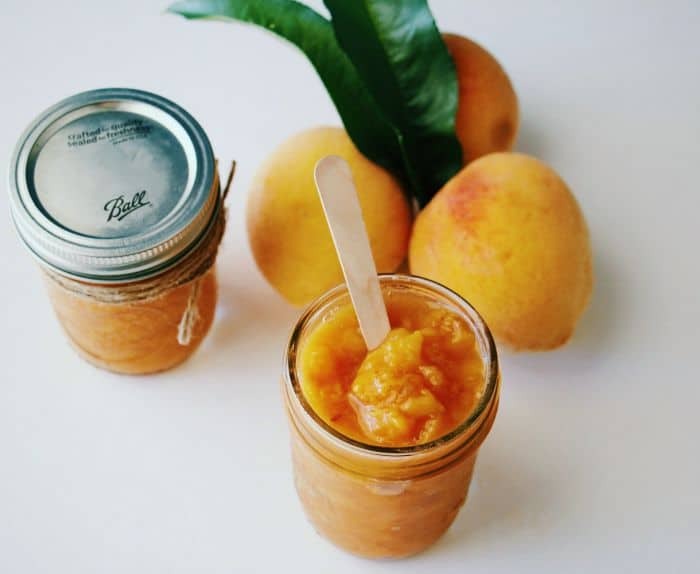 This peach butter looks absolutely delicious! I love almost all things peach so I cannot wait to try out this recipe. Even better that it’s only 3 ingredients! No artificial anything! Looks so delicious! Glad to read there is no Sugar involved! That’s my cup of tea!